For our eleventh mixtape, we’ve brought in a special guest to curate a mix: Baxtak of The Outtallectuals Collective. Baxtak, real name Aryan Ashoori, is the founder and one of the main members of the collective. Below we present a short look at the group. You can stream the mix here, and you can download the mix here. This guest mix from Outtallectuals takes the Ajam mixtape series to new planes, both sonically and geographically. The roots of this collaboration go back to 2014, when I stumbled on the collective’s website only to be greeted with a barrage of art and music in a unique aesthetic that was both fantastically diverse and futuristic at the same time. That year marked the release of their Ethnoeight compilation: a diverse and heavy mix of songs centered around the fusion between trap hip-hop and a wide range of generally “Ajam” influences. Outtallectuals contacted me to contribute a song to the release, in turn introducing me to the project. I felt that I had stumbled upon another world: the sound of the future, but without the Eurocentrism of the present. Since 2011, Outtallectuals has existed as part record label and part art collective. The artists present music and other forms of art in a variety of formats, both for digital downloads and as live performances. Most notably, the group’s members have been very active in Nepal and Bhutan. Importantly, Outtallectuals’ artists played a part in collaborating with local artists. This collaboration even involved performing in and organizing within Nepal’s music festival scene. This mix came to fruition as an attempt to use the Ajam platform to show artists who are critically and uniquely engaging with music that is often cordoned off into the “world music” sphere. Instead, Outtallectuals takes these sounds as influences to deeply connect with, rather than cliches to reproduce and slightly modify. To bring more context to this project, I had a chance to ask Baxtak, about the label’s past, present, and future. Ajam: Can you give us a brief history of Outtallectuals? How did you form the collective and when did it happen? Baxtak: Outtallectuals was born in 2011 out of a thread to share music with friends. The idea was to create a space for like-minded people to share their ideas and interests with regards to both art and science. This space first took form in Facebook and our website on the cyber realm and also in the form of music events in the physical realm and in the course of the next two years, we did a lot of one-off projects like a written TEDx presentation, a short comic / poem and short films. With improved online presence, the Outtallectuals identity grew, developing into an actual music label. Since then, it has steadily been evolving and we are finally becoming able to combine art and science in an innovative format through releases of thought-provoking art and a charity / development element. Ajam: There seems to be a very unique mission and goal behind Outtallectuals besides just curating good music. Can you talk about that a bit? Baxtak: Yes, sure! I have firm belief that next to its entertainment value, art should also aim to innovate and experiment in ways to benefit the community and the collective knowledge. The Outtallectuals mission is to present both of these aims to the human world in an increasingly unified package which entertains and presents something new. It is dreadful how much money is made in this industry from poorly thought-out music and how little of it goes back to strengthening the community or the art. This is a reflection of the human society and what the majority considers ‘good’ music; hence why we have the goal to model outtallectuality as not only an alternative outlet but perhaps also as a quality. Ajam: How did you become involved with Nepal and the Nepali music scene? Baxtak: That was born in a random encounter at a restaurant in Kathmandu when I visited Nepal in 2012. I met members of the now-disbanded Land Lock Roots reggae band, and started working with the band’s singer, Cultivation. 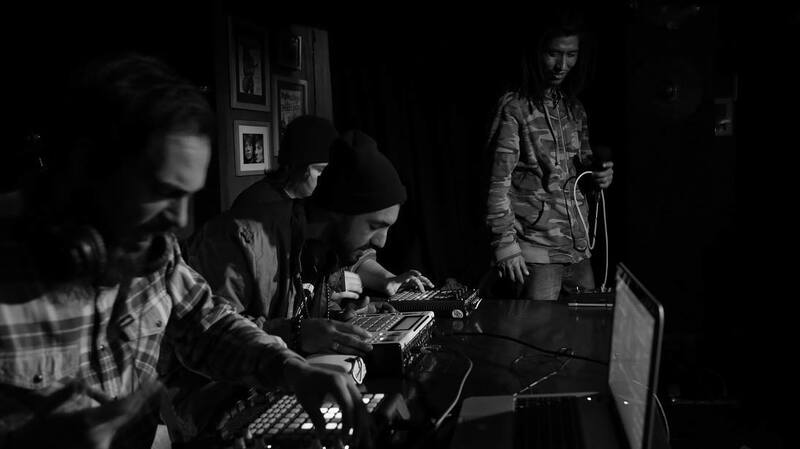 In the next few years, Cultivation became an integral Outtallectuals artist through a number of releases on the label and in 2014, I went back to Nepal to work with Cultivation in person and explore Nepal’s music scene. We did more than 30 shows in 7 months, a number of which happened in the other Himalayan nation of Bhutan as a part of its Bhutan International Festival. On another note, I have also been interested in rural development and that was another reason for going to Nepal. By March, we had managed to release our first charity compilation to build a school science lab in rural Gorkha; however with the enormous earthquake hitting Nepal, funds from the album went instead towards creating temporary learning centers (TLCs). In terms of both its music scene and infrastructure, Nepal is a country that needs development, therefore Outtallectuals definitely aims to stay involved in Nepal for the long run and as it grows, it will hopefully expand to other developing scenes. Ajam: You often present music on Outtallectuals that would perhaps be classified as “world” or “ethnic” music in more conventional formats. How do you navigate the often sticky connotations that comes with presenting this type of music? Baxtak: I suppose we try to find ‘world’ fusion music that has something to offer beyond just using ethnic sounds. There’s a very fine line between sounding fantastic and coming across cheesy. For this reason, we do our best to promote ‘ethnofusion’ music that blends the organic elements of world music and most up to date electronic production skills. ‘Ethnic’ elements are gateways to our ancient roots and they are best utilized when giving growth to new branches and leaves, while the electronic elements represent technological advancement. The plant metaphor works perfectly to explain this; the deeper the roots, the stronger the foundation, and the higher the plant will go, opening new and lasting horizons. We basically try to be the Sequoias, rather than the weeds. Members of the Outtalectuals crew working with Nepalese reggae artist Cultivation. Ajam: What should we look forward to in the near future for the Outtalectuals? Baxtak: Release-wise, we have a handful of EPs, a couple of compilations, 2 debut albums and two singles on the way in a variety of styles; from conceptual and ethereal to ethnofusion and reggae. There will also be music videos coming for a few of these releases. Event-wise, we are in the process of organizing a festival appearance in Switzerland, a Nepal Earthquake fundraiser event in London, and a Nepal-India tour for Cultivation’s debut album. In terms of our plans in Nepal, we will be looking to step up our charity work and hopefully through another compilation, coupled with the London fundraiser, we can partner with a local engineering firm to small scale but lasting infrastructure in rural Nepal. So yea, lots of different sized projects, but we’ll promise to keep them outtallectual!